The Fifteenth Alabama infantry was organized at Fort Mitchell in 1861; served in Virginia in the brigade commanded by Gen. Isaac R. Trimble; was in Stonewall Jackson's army and fought with distinction at Front Royal, May 23, 1862; Winchester, May 25th; Cross Keys, June 8th; Gaines' Mill or Cold Harbor, June 27th and 28th; Malvern Hill, July 1st, and Hazel River, August 22d. It fought and lost heavily at Second Manassas, August 30th, and was in the battles of Chantilly, September 1st; Sharpsburg, September 17th: Fredericksburg, December 13th; Suffolk, May, 1863; Gettysburg, July 1 to 3, 1863. Ordered to join Bragg's army, the regiment fought at Chickamauga September 19th and 20th; Brown's Ferry, October 27th; Wauhatchie, October 27th; Knoxville, November 17th to December 4th; Bean's Station, December 14th. Returning to Virginia this regiment upheld its reputation and won further distinction, as shown by its long roll of honor at Fort Harrison. It was engaged at the Wilderness, May 5-7, 1864; Spotsylvania, May 8th to 18th; Hanover Court House, May 30th; and Second Cold Harbor, June 1st to 12th. It was also engaged before Petersburg and Richmond. At Deep Bottom, August 14th to 18th, one-third of that portion of the regiment engaged was killed. Among its killed in battle were Capt. R.H. Hill and Lieut. W. B. Mills, at Cross Keys; Captain Weams (mortally wounded), at Gaines' Mill; Capt. P. V. Guerry and Lieut. A. Mcintosh, at Cold Harbor; Capts. J. H. Allison and H. C. Brainard, at Gettysburg, and Capt. John C. Oates died of wounds received in the same battle; Capt. Frank Park was killed at Knoxville, Captain Glover at Petersburg, and Capt. B. A. Hill at Fussell's Mill. Among the other field officers were: Cols. John F. Treutlen, Alexander Lowther, William C. Oates (who was distinguished throughout the war and has since served many years as a member of Congress and also as governor of Alabama); Col. James Cantey, afterward brigadier-general; Lieut.-Col. Isaac B. Feagin and Maj. John W. L. Daniel. Vol. IV--(425) Gen. F. K. Zollicoffer, September 24, 1861, says: "There is at Knoxville the Fifteenth Alabama, numbering 900 men, of which only 300 are fit for duty." Vol. V--(1030) In Trimble's brigade, Kirby Smith's division, Potomac district, January 14, 1862. Vol. XI, Part I--(415) Mentioned in Gen. L. McLaws' report of engagement, Dam No. 1 (Lee's Hill), April 16, 1862. Vol. XI, Part 2--(484) In Ewell's division during the engagements around Richmond, Virginia. (506, 608) Casualties, 35 killed and 117 wounded, June 26 to July 1, 1862. (605) Mentioned in General Ewell's report Seven Days' battles. (614-616) Mention of regiment in Gen. I. R. Trimble's report of the battles around Richmond. Captain Guerry shot while cheering on his men. (857, 864) Mentioned by Gen. Maxcy Gregg and Col. D. Barnes. (985) Capt. P. V. Guerry, Lieut. A. McIntosh killed, June 27th. Vol. XI, Part 3--(648) Trimble's brigade, Ewell's division, army of Northern Virginia, July 23, 1862. Vol. XII, Part I--(20) Mentioned by General Fremont. (713) Mentioned in Gen. T. J. Jackson's report of the battle of Cross Keys. (717) Casualties, 9 killed and 37 wounded, battle of Cross Keys and engagement at Port Republic. (779, 781, 784) Mentioned in General Ewell's report, at Cross Keys, June 8th: "The regiment made a gallant resistance, enabling me to take position at leisure." Capt. R. H. Hill and Lieut. W. B. Mills, killed; Lieuts. Brainard and A. A. Mcintosh, wounded, and Lieut. W. T. Berry, missing. (794) Mentioned in General Trimble's report of the battle of Winchester, May 25th. (795-799) General Trimble's report of the battle of Cross Keys, June 8th: "To Colonel Cantey for his skillful retreat from picket, and prompt flank maneuver, I think special praise is due." Vol. XII, Part 2--(180) Medical director's report. (184, 227) Mentioned in reports of Gen. T. J. Jackson and General Ewell of the battle of Cedar Run, August 9, 1862, (235, 236) General Trimble's report of Cedar Run shows that the regiment, under the command of Major Lowther, took a prominent part in that fight. Casualties, x killed and 7 wounded. (550, 562) In Trimble's brigade, Ewell's division, army of Northern Virginia, battles of Second Manassas. Casualties, 21 killed, 91 wounded, Manassas Plains, August, 1862. (708) Mentioned by General Early. (717) 4 wounded, battle of Ox Hill, September 1, 1862. (719) Mentioned in General Trimble's report of the battle of Hazel River, August 22, 1862. (716, 717, 810, 812, 813) 4 killed, 15 wounded, on the Rappahannock, August 22d to 24th; 15 killed, 38 wounded, at Manassas, August 28th; 9 wounded August 29th; 6 killed, 22 wounded, August 30th; 4 wounded, at Chantilly, September 1st. Vol. XII, Part 3--(964) Assignment as above, near Gordonsville, Va., July 31, 1862. Vol. XIX, Part 1--(806) Trimble's brigade, Ewell's division, Jackson's corps, Maryland campaign, Capt. I. B. Feagin commanding regiment. (813) Medical director reports 9 killed and 75 wounded, Maryland campaign. (973-975) Mentioned in General Early's report of operations, September 3-17, 1862. He reports 8 killed and 63 wounded at the battle of Sharpsburg, September 17th, and Captain Feagin seriously wounded at Boteler's Ford, September 19, 1862. 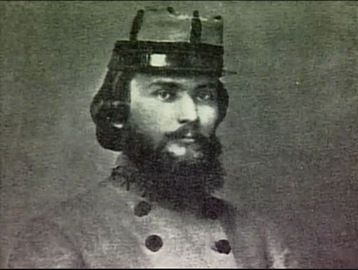 (977) Col. James A. Walker, in his report of the battle of Sharpsburg, says: "Captain Feagin, commanding the Fifteenth Alabama regiment, behaved with a gallantry consistent with his high reputation for courage and that of the regiment he commanded." Vol. XXI--(543, 561) Assignment as above, at battle of Fredericksburg. Loss, 1 killed and 34 wounded. (672) Mentioned in General Hoke's report of the battle of Fredericksburg, December 13th. (1072) Col. James Cantey commanding regiment. (1099) Transferred from Trimble's brigade, Ewell's division, Jackson's corps, to Law's brigade, Hood's division, Longstreet's corps, January 19, 1863. No. 43--(625) Mentioned by Col. J. L. Chamberlain (Union), in his report of the battle of Gettysburg. No. 44--(284) In Jackson's corps at battle of Gettysburg, July 1-3, 1863. (330, 339) Losses, 17 killed and 66 wounded, at the battle of Gettysburg. (362) Mentioned by General Longstreet. (392, 393) Colonel Oates' report: "Lieutenant-Colonel Feagin, a most excellent and gallant officer, received a severe wound, which caused him to lose his leg. Private A. Kennedy of Company B, and William Trimmer of Company G, were killed; and Private G. E. Spencer, Company D, severely wounded. Loss was 17 killed and 54 wounded and brought off of field, and 90 missing: 8 officers were killed. (418, 419) Mentioned in Gen. Henry L. Benning's report. No. 51--(18) In Law's brigade, Hood's division, army of Tennessee, General Bragg commanding, September 19-20, 1863. (303) Mentioned in Gen. T. C. Hindman's report, Chickamauga campaign. (332) Gen. Z. C. Deas' report: "Regiment behaved with great gallantry." (334) Mentioned in Col. S. K. McSpaddin's report. No. 54--(223) Assignment as above, autumn of 1863. (225-228) General Law's report: "Col. W. C. Oates, the gallant and efficient commander of the Fifteenth Alabama, was wounded September 27, 1863, Lookout Valley." Also other mention of regiment. (229, 230) Mentioned in Col. J. L. Sheffield's report, 5 wounded. (452) Assignment as above, November 30th. No. 55--(658) Same assignment, army of Tennessee, General Bragg commanding, November 20, 1863. No. 56--(615, 890) Same assignment, to December 31, 1863. No. 58--(641) Assignment as above, January 31, 1864. No. 59--(722) In Law's brigade, Buckner's division, under General Longstreet, March 31, 1864. No. 67--(1022) In Law's brigade, Field's division, First army corps, army of Northern Virginia, early in May, 1864. (1060) Partial return of casualties, 21 killed and 63 wounded in operations, April 14 to May 6, 1864. No. 80---(763) Casualties, 3 killed and 8 wounded, Richmond campaign, June 13th to July 31st. (812) Roll of honor, Fort Harrison, September 30, 1864: M. L. Harper (killed), Company B; W. H. Cooper, Company C; R. S. Jones, Company D; B. J. Martin, Company E; A. Jackson, Company F; D. C. Cannon, Company G; J. T. Rushing, Company I; C. J. Fauk, Company K; T. R. Collins, Company L. (Company F declined making a selection.) Darbytown Road, October 7, 1864: A. E. Averett, Company A; Sergt. W. W. Johnson, Company D; Sergt. J. K. Edwards, Company E; H. V. Glenn, Company F; H. F. Satcher, Company G; Sergt. G. B. Barnett, Company I; W. F. Hill, Company K; J. F. Bean, Company L. Other companies declined making a selection. October 13, 1864: W.H. Quattlebaum, Company D; A. Powell, Company E; John Jackson, Company F; E. Grice, Company K; Lee Lloyd, Company L. Other companies declined making a selection. No. 87--(877) Partial return of casualties, 10 killed and 92 wounded, August 1st to December 31st, Richmond campaign. No. 88--(159, 1215) Assignment as above, Colonel Lowther in command of regiment, August 31, 1864. No. 95--(1268, 1277) In Perry's brigade, paroled at Appomattox, April 9, 1865.